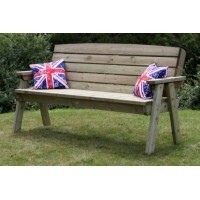 Garden furniture which is hand made in the UK is suitable for either domestic or commercial use. The timber is Tanalised E pressure treated with the latest generation wood preservatives to protect against decay and fungal attack, ensuring a long and low maintenance life. The hand crafted furniture combines beautiful styling with an extremely high standard of manufacturing, the products are hand finished and pre-assembled in the UK, using slow grown Scandinavian Redwood timber with high quality fixings. Providing the perfect solution for informal entertaining in any garden setting. Rocking Chair Ideal for relaxing in your garden the Cotswold Rocking chair is manufactured in the.. 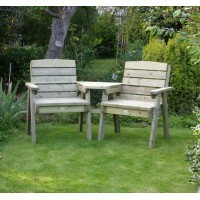 The Companion Seat is a fantastic addition for any sized garden two comfortable seats adjoined.. 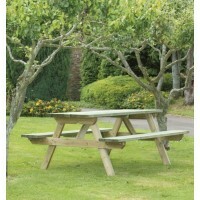 Ideal for informal entertaining or a seating area in any garden slightly curved high bac..
Rectangular picnic table is suitable for Commercial or Domestic use This large table is idea..